“How do we write a funny preamble about this one?” CB’s question is completely serious. She asks this while tipping her bowl to drink the last dregs of the Quinoa Pad Thai sauce. Some things just fall straight into your lap, don’t they? That being said, I’ve given this some serious thought and this is a recipe that will easily and effectively become vegetarian by replacing the chicken with tofu or Quorn chicken pieces, prepared however you like it. The truth is, the chicken isn’t the star of the show – it’s just a convenient and tasty vehicle. 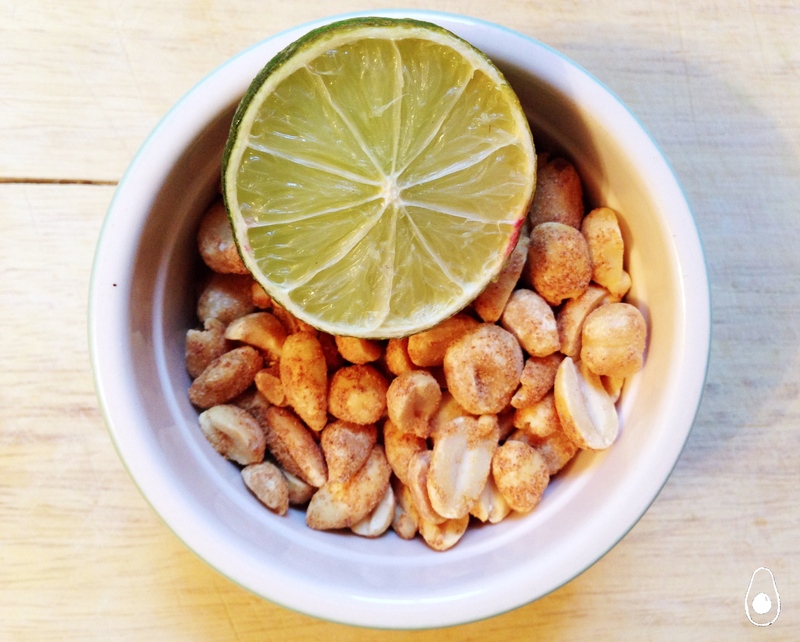 The recipe is tasty, quick and, if you halve the amount of peanuts and peanut butter (oops), it’s pretty healthy. I recommend it for weeknights when you don’t have the time or inclination for anything fancy but want to maintain at least a modicum of good nutritional practice. In the ingredients, I have listed a bag of stir fry and edamame beans as separate items but we found that Sainsbury’s does an edamame stir fry pack which will tick both of these boxes perfectly. 30g of peanuts, roughly crushed. Meanwhile, combine all sauce ingredients in a microwave-safe bowl then microwave for 30 seconds.Stir until as uniform as possible. Set to one side. Beat the egg and a drop of oil in a small bowl then set aside. Season and cook your chicken or alternative as preferred: we always use the George Foreman for 10 minutes but you could similarly pan fry it for about 5-8 minutes on each side. Either way, only dice the chicken when it’s cooked, to maintain succulence. 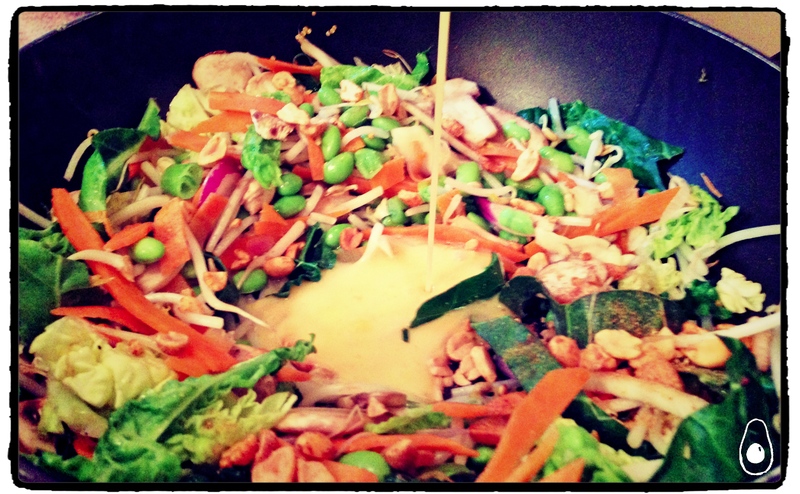 Heat the 2 teaspoons of oil in pan then add the stir fry and edamame and the spring onions. Fry for 2-3 minutes then create a well in the centre of the pan and pour the egg mixture straight into this until softly scrambled. Don’t mix it in yet. Add your finished chicken or alternative, quinoa, sauce, and half the chopped peanuts to wok then toss to combine until the egg is cooked. Add lime juice. Serve with remaining chopped peanuts, plenty of chopped coriander. GREAT dish. Really easy to make and full of flavour. Perfect for making a lot which can be eaten over a few days. Highly recommend. Thanks guys!! Now this is CREATIVE!! I love pad thai but never ever thought of using quinoa instead!! Delicious! Quinoa + pad thai = stroke of genius. Fab recipe, Mandi! We whipped up this tasty little number last night while house sitting: not convinced it’s as quick as you say it is [it took me a nose under fifty minutes from poppin my first edamame, to putting it on the counter]: but that’s gonna be user error, yo. We made a few tactical substitutions based on the lack of items in the local little Waitrose: so we went for podded-up edamame, dry noodles cooked separately instead of quinoa+stock, red wine vin, instead of rice wine v, seasoned our chick’un in chinese 5 spice, extra coriander, and fried it all up in sesame oil. Because I’m kinda [sesame] seedy, I went for whippin’ that egg with a drop of ol’brown sesame too. I may have underdone it on the water in the sauce front, as well as having the classic “thirsty noodle drink all the juice” problem, as it was kinda dry, so had to pep it up with the juice of half a lime for each portion. I made so damn much, there was a ton of it left over for lunch, and microwaved on a nice low power with water sprinkles every 1.5 minutes, it was just as fine being guzzled the next day as it was the night before. Served it all up with an extremely crisp 100% Australian Chardonnay [McLaren Vale Chardonnay 2013], and it were smashin’ like. The oil of the nutz was no match for the cool acidity of the young wine, so made a pair like Whitney and Bobby, in the good days. Another brillo recipe MadAvocado+”CB Sous Chef”, looking forward to seeing you ladies soon.